The racing was over, all the guests had left except Dave, Compass Rose was ready for sea. It was time to leave Antigua and begin sailing south. The first hop was from Falmouth Harbour, Antigua to Deshais, Guadeloupe. The trip is a little over forty miles almost due south. We kept going back and forth over which day to go to get the best weather. We had actually cleared out stating our intention to go the following day, but when we got back to the boat we realized we had no need to stay. We did the final bits to ready Compass Rose for sea, raised the anchor, and hoisted sails. We got out of Falmouth Harbour and found the wind to be a bit lighter than we had expected, but we pressed on. It eventually filled in, but we had to sail pretty high to keep from being pushed off course by the prevailing current and our speed was less than we hoped for. 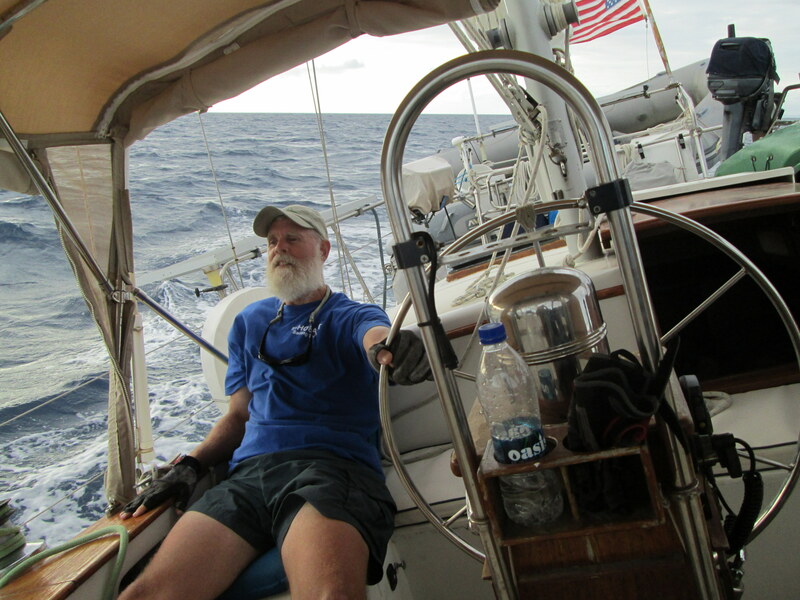 Dave was at the helm and stayed there keeping us on the wind – a bit difficult in light wind. The helming paid off by putting us in a good position to take advantage of a favorable wind shift towards the end of the sail. Unfortunately the late start and the low wind speed caused us to come into Deshais after dark for the second time this year. We managed to find a good spot in the anchorage, run up the yellow flag, and settle in for the night. We got up the next morning, had a leisurely breakfast, and headed south for Les Saintes, a group of islands just south of Guadeloupe. The trip took us down the leeward side of the island, which can be an interesting trip because the high mountains effect the wind. We have actually sailed at another boat that was on the same tack as us, so the wind was hitting each of us from opposite directions. 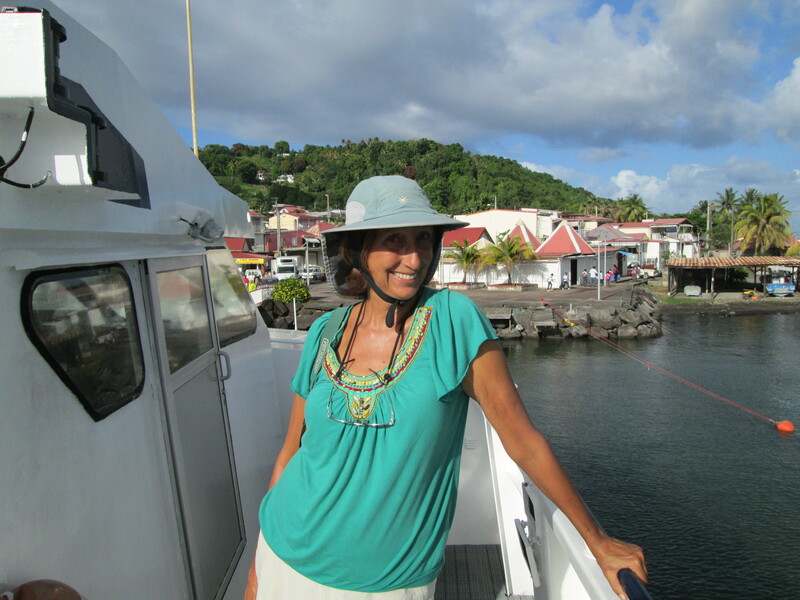 We sailed, motored, and motor sailed as needed to reach the south end of Guadeloupe. As we cleared the island, the wind and waves settled in from just south of east. We couldn’t sail southeast to get directly to Les Saintes so we just did the best we could and planned to tack back in the lee of the islands. Rosie rolled along well under autopilot, but I took the helm when we decided to tack. Jackie released one sheet and Dave hauled in the other while I steered us through the wind. We had just settled in on the other tack with the boat sailing nicely When a noise came from the front and the duckbill popped up. This was very bad. If the duckbill let go the main mast would fall down. I got the boat into the wind to take the load out of the sails and started the motor while Dave and Jackie rolled in the jib. Jackie took over on the helm while Dave and I got the main sail down and stabilized the mast to the front of the boat with a spare halyard. We then motored slowly into the wind and waves and picked up a mooring off Terre de Haute, the main town in Les Saintes. It turned out that the wire in the bobstay broke. This is a heavy wire that holds the duckbill down, thus counteracting the force of the forestay. We were stranded in Les Saintes until we could replace this part. We began trying to track down someone who could make a new bobstay for us. Remember that this is a French island – most people do not speak English. This would require the proper fittings and a machine to swage the wire into the fittings. We found a sailmaker on the island who thought he might be able to point us in the right direction, but when he saw the parts he realized no one on the island had tools big enough for what we needed. He recommended a company in Pointe a Pitre on the Guadeloupe mainland. We tried contacting them, but had no luck. We did, however contact another rigger there who could make a new bobstay while we waited. The adventure begins. We have to figure out how to take the ferry to Trois Rivieres, rent a car and drive to Pointe a Pitre, have the part made, and return. We get some info and early the next morning we catch the 6:45 AM ferry for the ride to Trois Rivieres. The sailmaker assured us that there were two rental car companies on the dock in Trois rivieres, but one had no cars left and the woman at the other only spoke French. We never figured out whether she was out of cars or just wouldn’t try to rent a car when the deal couldn’t be completed in a common language. We talked to someone from the ferry company and he told us where we could catch a bus. It was a ten minute walk up a steep hill to the next town. Once there we happened upon a woman who spoke no English, but was going to Pointe a Pitre – just follow her. The bus comes and we get on. We ride a short distance, get off, and run for another bus. Our leader gets on and gets right back off. The bus is a local, not an express. We wait a few minutes and catch the express to Pointe a Pitre. We’ve been to Pointe a Pitre before, so the rest is easy. We catch a taxi to the marina, find the rigger and show him what we need. He can make it – be back at 12:30. We head for the chandlery and grocery stores to get some supplies, then grab some lunch. We return about 12:15 and find the rigger starting to drive his wife to the airport. We misunderstood the time. He gives us the part, we pay him, and we head for downtown Pointe a Pitre. We don’t find a taxi, so we get on a local bus. Unfortunately the bus driver is going off shift and we have to wait for the next driver. Finally the bus takes us downtown and we walk to the main bus terminal. We know we need a bus that goes beyond Trois Rivieres and after asking around another bus driver directs us to the lane for that bus. The bus arrives and we show the note with our destination to the bus driver. He says oui and off we go. We begin to realize something is not right. The bus is making a lot more stops than it did in the morning. We are on the local! Our tickets say the ferry leaves at 3:45, the bus is moving slow, the clock is moving fast, and it’s a long swim from Trois Rivieres to Les Saintes. We are sweating a lot more than usual for a warm Caribbean afternoon. The bus finally drops us off at our stop, but we still have to get a local bus. We wait. Jackie starts hitchhiking. The bus comes and the driver seems to understand where we need to go. The street through town is one way, so the driver has to drop us off a few hundred yards from where we were picked up in the morning. We start walking down the hill with time to spare. We come to a little snackette where we can see the ferry dock. We decide we have enough time to split two beers among the three of us before we have to board the ferry. The cold beer tastes especially good after the fast hike down the hill. We finish the beer and walk to the dock. There is no ferry. We had originally been told that the ferry left at 4:45, but our tickets said 3:45. People are slowly wandering in to the area and some are sitting down and placing orders at another snackette next to the dock. We finally join them. Dave and I have more cold beers. Jackie has to find out what the tall green drinks are on many other tables. After playing 20 questions and pointing at a lot of glasses on tables she finds it’s cold Crème de Menthe and water. Very refreshing. We board the ferry relaxed and refreshed. 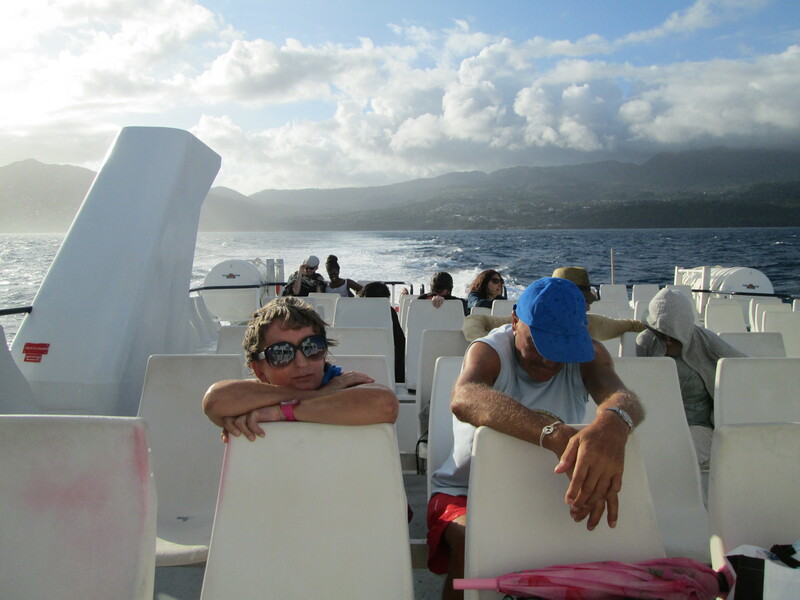 We grab the three driest (a relative term) seats on the open upper deck and enjoy the view as we speed back to Les Saintes. The next day is boatwork and wash day. Jackie and Sherpa Dave take the laundry in while I start working on Compass Rose. The fuel filter needs changing, batteries need topping up, and I install a new bilge pump float switch. Dave and Jackie return and we install the new bobstay and put new backing washers behind the bolts that hold on the duckbill. Then we tighten all the rigging that we loosened to get the duckbill in place. Little Rosie is once again ready. It wasn’t all work in Les Saintes. We hiked around a little and ate French food. We visited with Bruce and Carol on Wild Matilda and kept bumping into Rob and Ellen on Miclo III, and Anna and Hakan on Unicorn, and a few others. The Triskell Cup Regatta passed through and we got to say hello (but not much more) to Steve on Hotel California Too. And to cap things off, the French Navy rotated two ships through just as we were leaving. We are off to Dominica. Next: The land of Parrots and Rainbows. This entry was posted on May 18, 2014 at 9:00 am and is filed under Uncategorized. You can follow any responses to this entry through the RSS 2.0 feed. You can leave a response, or trackback from your own site.